Our nature, bird and animal sounds albums take you into the deep woods, prairies, lakes and along the shoreline. We have albums that are made for streaming with bird calls, storms, thunder, spring peepers, frogs and all sorts of sounds of nature. Many of our tracks you can loop for relaxing background sounds, white noise, meditation and sleep backgrounds. We also have albums with collections of bird and animal calls which can be streamed or downloaded and converted as ringtones for your Android mobile phone. Buy the tracks individually or the entire album of short tracks and create great bird and animal custom ringtones, alerts and alarms. Check our streaming albums on Spotify, Apple Music, Google Play, and your favorite streaming site. Please use our sounds responsibly! They are extremely high quality and can be disruptive to birds and wildlife if misused. We recommend following the American Birding Association Code of Ethics . Ospreys are found on all continents except Antarctica and are always found near bodies of water. They migrate from their breeding grounds to warmer climates where their main food, fish, is plentiful. These large predators hover over the water and then plunge in to get the fish which they hold in their talons as they fly back to their nests. Ever see a bird shaking in the air like a dog? This would be an Osprey! These very large birds are very happy to nest on platforms built for them, and raise their chicks, and these platforms have been very helpful in reestablishing birds after years of loss of eggs from DDT. 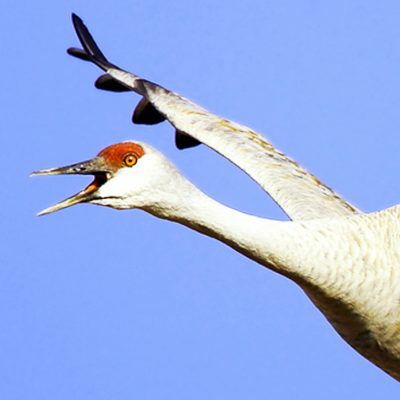 Sandhill Cranes are very tall birds that are gray overall with a beautiful red crown. They form large flocks in the winter and forage for grains along the grasslands and wetlands of the southwest. Congregations of over 500,000 cranes occur along the Platte River in Nebraska in February and March. They also spend much of January in the southwest from Texas to California. Their common name comes from the Sandhills of Nebraska, which is considered to be their most important stopover point during migration. Their distinctive bugling call can be heard up to two miles away!